There is a section of Ashburn called Data Center Alley. Somewhere around 70 percent of the world’s Internet passes through this corridor. Yet 20 miles down the road large portions of the western part of Loudoun County don’t have Internet access. All Points Broadband, a wireless service provider which recently absorbed Road Star Internet, hopes to change that by primarily focusing on delivering Internet to unserved or underserved areas. Beginning Nov. 1 Road Star customers will become All Points Broadband customers. Over the next few months the company will be investing more than $2 million in state-of-the-art wireless equipment and the construction of fiber-optic cable. “We know that the state-of-the- art fixed wireless equipment can deliver high-quality unlimited data to the western part of the county,” said Jimmy Carr, the president of All Points Broadband. A gap study was conducted by the county in April to determine where Loudoun could improve its Internet connectivity. For decades disagreements over unsightly cell towers and indecision on the issue of connectivity have left western Loudoun behind in the race to arm all citizens with Internet. 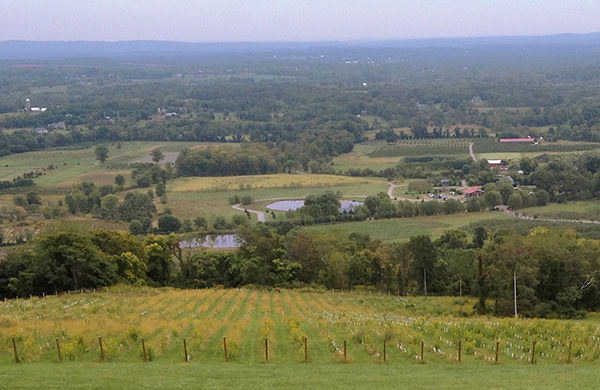 Because of the lack of population density in western Loudoun and the higher levels of foliage, the infrastructure costs to connect citizens outweigh the money that most major fiber-optic cable and Internet companies can make. Loudoun will have to ask residents to reconsider its past stance on cell towers and look at ways to make a business case for providing Internet to western Loudoun so students and businesses don’t fall behind in the race for connectivity. One suggestion was to host the towers on public land. Another was to host a Broadband Summit annually to discuss roadblocks to service and a modification to planning and zoning ordinances regarding towers. Carr said the technology to provide low-cost wired and wireless Internet is rapidly improving. He believes the wireless Internet his company can provide will be indistinguishable on most home networks from the wired Internet in the western portion of the county. New residential plans will start at $79 a month for an unlimited connection. Most other options in areas unserved by fiber-optic cable have limited data plans or are much more expensive. “If your readers in western Loudoun think they don’t have an option for fast Internet, they now have an option,” said Carr. Virginia Everywhere, a new Ashburn-based company, is acquiring Roadstar Internet Inc. as part of its effort to improve the quality of broadband Internet service available throughout the state. Roadstar was founded by Marty Dougherty in 2002 to provide wireless broadband service to homes and businesses, primarily in rural western Loudoun. Over the past decade, the company has grown to become the region’s top wireless Internet service providers. Virginia Everywhere President Jimmy Carr said Dougherty has been at the forefront of fast developing access technology for two decades and will serve as the company’s vice president of technology. The company’s first focus will be expanding service in Loudoun using hybrid wireless and fiber-optic networks. “We are excited about this partnership and to begin upgrading the broadband infrastructure in Loudoun County. Roadstar’s customers and their neighbors will be the first to benefit from the substantial investments we will be making,” Carr said. Roadstar has about 2,000 customers. While the company will begin in Loudoun, the vision is broader. “We call it Virginia Everywhere for a reason,” Carr said. “Loudoun County is the home of the global Internet and it is also our home,” Carr added. But the firm’s long-term goal is to bring broadband access to communities where the current options are too slow, too expensive or don’t exist. “We want to provide choices and options throughout Virginia where people don’t have them,” he said. “This transition will result in significant improvements for our customers, deployment of the newest technologies, and expansion into new areas,” Dougherty said in a statement. Virginia Everywhere and Roadstar expect to complete the transition by early fall. Roadstar customers will receive additional updates, but are promised there will be no disruption of service or changes to email accounts. Noting Loudoun’s Board of Supervisors has acknowledged the importance of broadband services, Carr said the company is interested in hearing from others who want to help expand Internet access—including governments, community organizations and Internet service providers seeking additional capital.